Walking down 5th avenue in Playa del Carmen, Mexico, I spotted a small red Fiat 600 on one of the side streets. It had stickers all over it and looked small enough to put in your pocket. Two tall guys stood outside of it, and I just had to go ask them what they were doing with such a tiny car. It turns out this small 1964 automobile is not just a car, but an instrumental part of a pretty damn cool travel project. 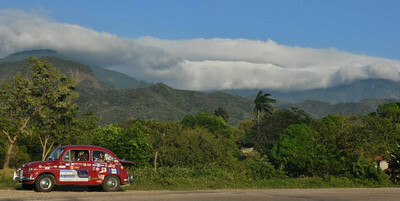 Juan Manuel Rizzatti and Santiago Uranga are the drivers and have brought the Fiat all the way from Argentina. They are only about halfway through their journey; their final destination is Alaska, and along the way they’ve been spreading seeds (quite literally) of change. Intrigued by the project, I peppered them with questions. Alaska bound! 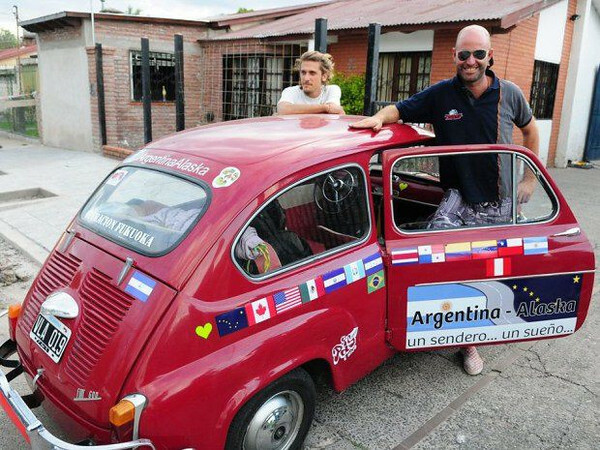 Juan Manuel Rizzatti and Santiago Uranga started their journey in the ‘fitito’ from Rosario, Argentina on January 26, 2013. TL: That’s a tiny car! How long can you drive before you NEED to stop and stretch your legs? JMR + SU: Haha, it’s a good question. Usually we decide if we drive at night or during the day depending on the weather of the place. When it’s too hot, like it was in Chile’s and Peru’s deserts, we drive at night. We don’t stop so much at night because there are not many things to see or places to go, so we can drive maybe three hours without stopping. By that time the body starts to beg for a little walk. When we drive with the sun over our heads, because of weather, or in some places also for security, (we try to avoid the roads during night in some regions), then it is the car who demands us to stop. His temperature rises in hot weather and if we add climbing a mountain, for example, we can stop every 20 minutes to let the engine breathe. Sometimes we also stop when we see a nice place to plant seeds. I guess the most we’ve been without stopping was three hours. Maybe that’s why it took us one year to get from Argentina to Mexico! But, despite the appearance, the little Fiat is not uncomfortable at all; what tires the driver the most are the hard ‘pedals’ and the attention you must keep on the road to not hit a pothole and ruin the car. Giving ‘la Brasita’ a chance to catch its breath at Paso de Jama, Chile. Altitude, 4,200 meters. Okay, now tell us about yourselves and this project. You have driven from Argentina to Playa del Carmen, Mexico, and are on your way to Alaska. Why are you doing this? We do this because both of us love traveling, knowing places and people from different realities. Being ourselves in moments and situations where you feel freedom and a special perception of life and existence. We wanted to know the whole continent and spread a nice message on the road by leaving trees everywhere. In this case, because of the car, apart from the ecological message, I think we also carry an inspiring message, being an example that everything is possible if you focus, if you put your energy on that, if you do it with love and respect, giving thanks and having faith. TL: What inspired you to take this project on? The idea of doing this in the Fiat comes from a police friend of ours. This car is a classic in Argentina and still very popular. Santiago wanted to go to Uruguay to exhibit some of his photos in a gallery. He wanted to go in the ‘fitito’ (as we call them back home), despite everybody telling him he was crazy, that he would never make it with such a little old car to Uruguay (900km away; we’ve done around 25000km on this trip already by the way). So he called the police friend to ask him if the papers for the car were all in order to take it out of the country. A few days later he called saying, “The documents and everything are fine. With this car you can go to Alaska if you want!” So we thought: Why not?? We were also inspired by Masanobu Fukuoka, the Japanese permaculturist who used ‘seed bombs’ (called nendo dango in Japanese). He inspired us to plant trees all along the way. We wanted to do something related with the environment and ecology so these bombs were a great idea. After a few months, we started to plant seeds directly in the ground because of the weight of the clay used in the bombs. This project has been very nice to do, and as everything comes back, this help we are giving to the Earth comes back to us in love, friends, gifts, and many other ways of ‘help.’ This is our inspiration now to continue on this path. “Remember Santiago! Because I know you…This is an old car, don’t go around everywhere with it. It’s too old and small. It is just to use on Sundays.” This is what the previous owner said when he sold it. We say the Fiat has had maaaaaany Sundays! How we came to have the Fiat: Santiago needed a car to go out just for one night, so he called a friend to see if he could borrow one of the cars on sale — just for the night. Between many other beautiful classics, this Fiat 1964 was chosen. When he took it back the next day, he couldn’t part with it and he became its new owner! 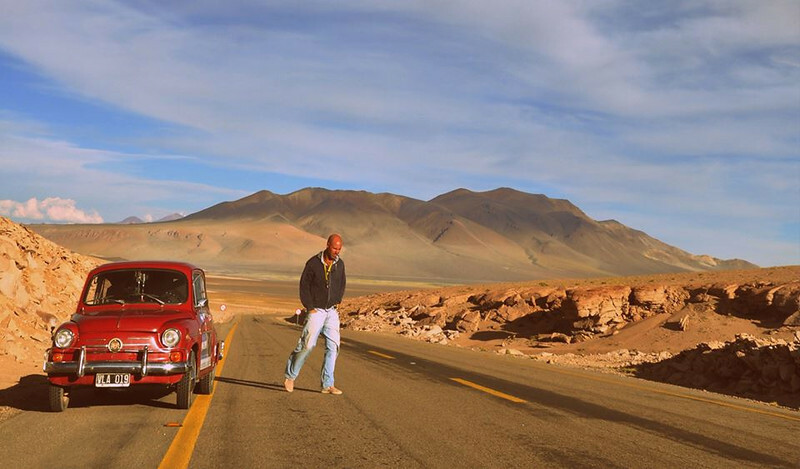 It’s a red Fiat 600 made in Argentina in 1964. It is the last model with the suicidal doors that open from the front. It keeps its originality, and the engine is a 755cc, which makes it very cheap for fuel. We can do about 20km with one liter. TL: Have you had any breakdowns or malfunctions with the car that have affected your schedule or route? Just crossed in to Mexico. Ufffff…We have had to stop many, many times because of the car. At the beginning, we had no idea of how to fix it — not at all. We depended completely on other drivers to help us. With time, experience, and after asking thousands of questions to dozens of mechanics, we learned how to do the basics, and some other necessary things that came up. Every time we have had any issue with the car, something good, positive, nice, or interesting happened because of that. As we don’t have a schedule or pre-established route maps, we say it is the car who decides the road and our destiny. We thank him. It is important to say that the parts are almost impossible to get outside of Argentina or Italy, and we are here thanks to Leiva Autopartes. They sponsor us with all the necessary things for such a trip!! TL: What countries have you been to and when did the trip begin? How many miles (or kms) have you driven so far? We started on the 26th of January, 2013, from Rosario, Santa Fe, Argentina, with some TV cameras, family, friends, and people that read about the trip in the newspapers. We’ve been through Argentina, Chile, Peru, Ecuador, Colombia, sent the car in a container to Panama (we went in a sailboat), then Costa Rica, Nicaragua, Honduras, Guatemala, and now Mexico. We have made almost 25,000km, and I say almost because the ‘counter’ of the car doesn’t work and we calculate with the GPS and other travelers’ calculations. But that would be the approximate number and I think it is around half of the way to Alaska. TL: What have people’s reactions to the project been like? It has always been unbelievable, and the further we are from the start, the more people help. The first reaction is when they see the car, because of its beauty. The second reaction comes when they see the flags because of the adventurous spirit, and the third reaction is when they meet us, because of the craziness! Haha. Seriously though, people have helped us a lot and it is because of that, that we can do this. Every encounter has been very positive. Everybody is immediately intrigued by the car. Car clubs have helped us a lot. Collectors, classic cars lovers, and people who feel this passion for cars — I think they can imagine better than most what it means to travel in such a car, and they always help us. They open up their doors for us and want us to take away a nice memory of their club, and their country. Planting seedlings along the way. As you know, to buy fuel, to pay road taxes, and to get some food — we exchange stickers for any volunteer contribution. We get love from many people that see the car and feel happiness with this kind of thing — people who like traveling, cars, music, trees, etc. Also via our Facebook page, we receive lots of positive messages and good wishes, for which we are very, very grateful! TL: What is one of the most memorable things that has happened along the way? The funniest? Uff, there are so many. But one we will always remember is when we were crossing the Andes from Argentina to Chile through the Paso de Jama over 4,000 meters above sea level and the car couldn’t climb a mountain because of the lack of strength, and the lack of oxygen you have at that altitude. So we had to push the car at least the first five meters until it picked up a little speed. The idea of not being able to leave that place, the strong wind, the strong cold that was starting with the sunset, and the strong pain in our chests because of the altitude and the effort, are feelings we will not forget. And in such a place with such a view! A funny moment was in Peru in a little town where we arrived very tired. Santiago was feeling quite sick, so we needed to get a place to rest quickly. In the rush we entered a strange place with a woman that was looking at us with a stranger look on her face than normal. When we entered the room and saw the zebra print bedspread and mirrors all over, we understood the amazed look on her face! Hahaha, we joked so much with that woman that Santiago forgot all about being sick! TL: How are you funding this? Are there ways people can help out? We started with some money we had saved, and we have worked a little on the trip, playing guitar on public transport, in restaurants, in city squares, and doing some juggling, or just getting some temp work in places where we have stayed a bit longer. Since Colombia, we have been using our stickers to exchange for donations, from which we pay for things concerned with the car, and some food, etc. It’s been a great thing to do, because the donations come with a special energy that we appreciate and respect a lot. Now Trevolta is helping us to raise funds, which is great! If anyone wants to help us on or trip, they can do it through Trevolta. 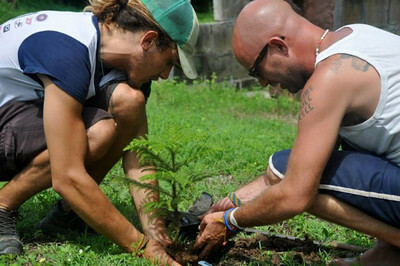 TL: Part of the reason you’re doing this is to spread some love for Mother Earth. Do you have any tips for everyday things people can do to be more ecologically minded? Yes, this is such an important thing, isn’t it? We believe that we all must start to support in our own way, to plant our seeds and watch them grow and spread. It’s real that the change depends on each of us. We say that the smallest action is worth more than the biggest idea, and that each grain of sand is small, but there are mountains of sand! Despite its appearance, Santiago and Juan say that the little Fiat is not as uncomfortable as it looks. We should start from obvious things, like not wasting water or electricity, not throwing garbage everywhere, trying to recycle and reuse. We should all try to reduce consumption and consumerism. Then we must try to be conscious about our living planet, where we live: this magical and lovely living rock spinning in the universe, which we must take care of instead of destroying. Be aware of trees’ beauty; we need them to live and to breathe. They can feed us, and are extremely beautiful beings. Be kind with animals and start to love each other and the Earth, because at the end, you, me, birds, dogs, trees, water, we are all the same! 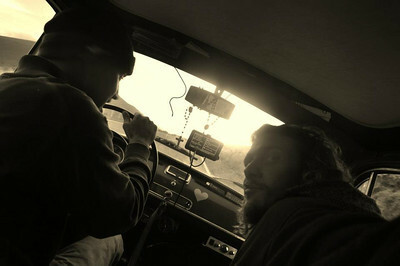 Check out Juan and Santiago’s Facebook page for more info and to follow their trip.